In his exhibition “Starting a Bush Fire,” Jamaican-born, Atlanta-based artist Cosmo Whyte presents sculptures made from found materials, photographs, and a series of drawings that circulate around the theme of the dislocated body. Specifically, the artist’s work conjures the history of the displacement of black and brown people from the slave trade, the Great Migration, and the global refugee crisis. Hanging high on the wall in the foyer is Guess Who Is Coming to Dinner, 2017, a collection of orange life jackets thickly adorned with mussel shells. Farther into the space, the arresting photograph Stranger than the Village, 2015, features the back of a black man in a suit, a megaphone balancing on his head of braids. Pinned to his jacket is an image of James Baldwin, also in a suit, looking out at the viewer. A reversal, and a reminder: We must go forward into the future, with the faces of our past champions emblazoned on our backs. 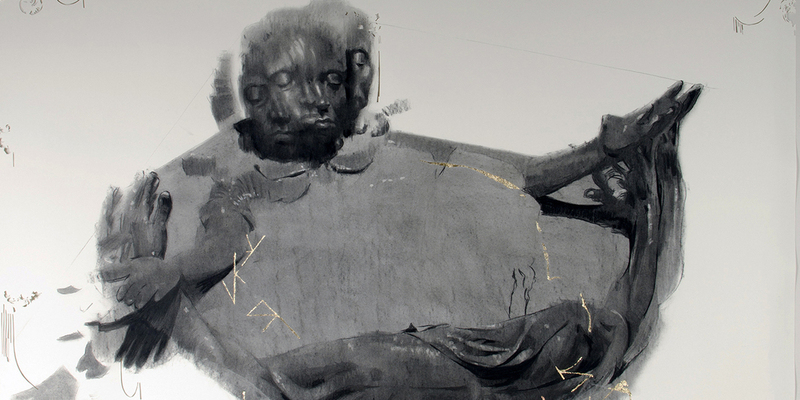 Whereas the sculptures and photographs are more legible in their commentary on race and identity, the series of drawings lining the walls—worked and reworked in charcoal, with several sections of the paper cut like lace or layered with gold leaf—offers a more lyrical meditation. Often, faces of figures are obscured, sometimes by long tendrils of braids, or, in the case of Scalp, 2017, removed almost completely and replaced by a patch of black glitter. Part celebration, part consternation, the exhibition is dazzling in its ability to render the emotional complexity of diaspora. Like the crier who both belongs to the village and is apart from it, Whyte proclaims the news of the day, even to what denies him community.